A prominent abstract painter of the 1960s and 1970s, Alma Thomas was the first African American woman to have a solo art exhibition at the Whitney Museum of American Art in New York, in 1971. Born in Columbus, Georia on September 22, 1891, Alma Woodsey Thomas was the eldest daughter of John Harris Thomas, a successful businessman, and Amelia Cantey, a dress designer. 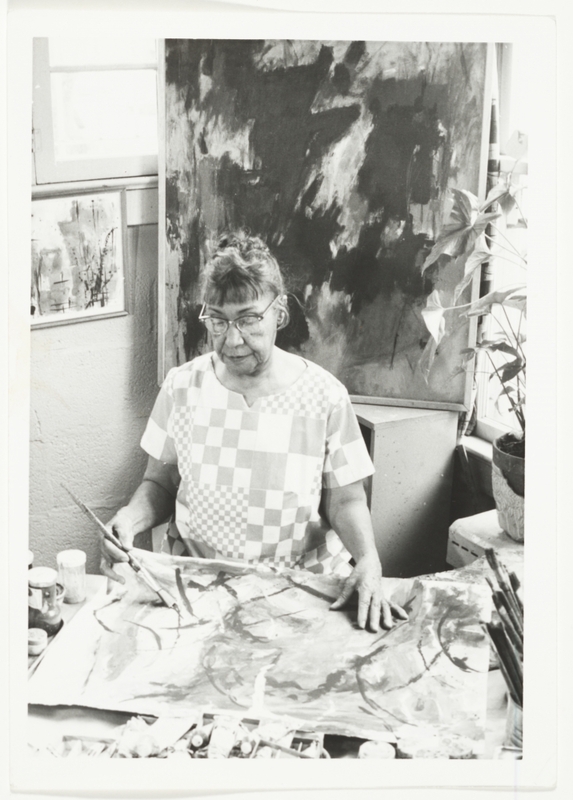 Alma Thomas showed artistic tendencies as a child when she used local clays to make homemade puppets and sculptures. Her home life was a constant changing environment of cultural activities, as her parents arranged for various lecturers and speakers to make presentations there. Despite this rich atmosphere of culture, the prevalent social ills of racism and a poor education system for African Americans caused the Thomas family to worry about the future of their family in Georgia. In 1907 the Thomas family moved to Washington, D.C., where they settled in a house that Alma would occupy for the next seventy-one years and that remains in the Thomas family to this day. After teaching art for several years, she enrolled at Howard University in Washington, D.C., to study costume design. She graduated in 1924 with a bachelor's degree in fine arts, becoming the first Howard University student and perhaps the first African American woman anywhere to hold that degree. After a long and distinguished career as a teacher, Thomas retired in 1960 to focus her energies entirely on her own art. During her professional career she had remained active and visible in Washington's growing art community, and in the late 1950s she developed the confidence and knowledge to pursue the highly colored abstract style for which she is known. Her close relationships with fellow artists Gene Davis, Jacob Kainen, and Morris Louis of the Washington Color Painters, whose works emphasized abstract color shapes, assured her acceptance in this circle. Thomas's work was included in the important show Contemporary Black Artists in America , held in 1971 at the Whitney Museum in New York. Thomas died in Washington, D.C., in 1978 at the age of eighty-six. Three years later a posthumous retrospective exhibition was held at the Smithsonian Institution's National Museum of American Art. In 1998 the Fort Wayne Museum of Art in Indiana organized a retrospective exhibition of her paintings that traveled to Columbus. Today her work can be found in many major museums.